I fell in! or, getting it wrong at Hinkshay. There is a path you can follow from Coalport Bridge towards the China Museum, along the river side of a ditch which may be a remnant of the canal. It leads past the back of the Brewers Arms Inn, which has a bricked-up archway at canal level, suggesting that it once was a customer of canal transport. A little further along, beyond a modern sewage outfall, although the path continues the ditch is filled in. However, it is possible to continue along a level straight path, surely still the line of the canal, until stopped by a fence just before the China Museum, in the grounds of what was the NuWay Manufacturing Company. At this point it becomes apparent that you have been trespassing for some time and there is no way out - all the gates are securely locked. You have to go back. 2010 - This area was built on some years back, and the NuWay building refurbished as maisonettes; however, the main access drive still follows the line of the canal. This concerns the section between Coalbrookdale and Doseley. It is difficult to deduce the exact line of the canal as it turns north from the visible section at the three lanes of Burroughs Bank and crosses Holywell Lane, somewhere between its junctions with Woodlands Lane and Burroughs Bank. (Tony Clayton's map shows it going directly from Crackshall Lane to Stocking Farm: but the map is a photocopy, and I think that has been added in pencil. It would leave the Burroughs Bank traces unaccounted for. But the plateway which succeeded the canal might have gone that way.) Rather, there is a point where the only building on Holywell Lane, a modern house, is aligned at right-angles to the road. Is it too much to suppose that it is on the foundations of an older building which was aligned along the canal? I like to think not; and in support of the deduction, there are traces of old brickwork in the hedge on the other side of the lane. I guess that the lane might have originated as a plateway from Lightmoor to Doseley, connecting with the canal here. The section of the Coalbrookdale canal from the cottage in Woodlands Road to a path which runs from St Lukes' Road, Doseley, past the back of the premises of Ennstone to somewhat higher up Woodlands Road, is still there, if dry. I found it by pure deduction, and was very proud of myself. (It's on Tony Clayton's map, but who cares?) I was walking down that path towards Doseley, and noticed that the curve of the trees around the side of Ennstone exactly mirrors the curve of the canal on the map in Barrie Trinder's books. "In which case", I thought, "the canal should be down here". I scrambled twenty feet or so down the bank, fought my way through a thicket of thistles, brambles and nettles, and to my utter delight found myself standing in the bed of the canal. It would be trespassing to follow it, so of course I wouldn't do that (honest, officer!) - but if one did, it would lead to the back of the ruined cottage on Woodlands Lane. Note: (Apr 2000) - there is now a courtesy path along this stretch. It is known that the railway north from Lightmoor was built on the towpath of the canal. At what point does the canal, running south east from Johnsons Pipes at Doseley, cross St Lukes Road to reach the railway? Well - there are old properties both sides of the road, except for two places, almost opposite, where the houses are modern. I postulated that the canal crossed the road here at an oblique angle before meeting the railway and turning south: this would agree with the David and Charles map, as far as one can tell. Wrong. Tony Clayton's map clearly shows the canal parting from the railway and keeping east of St Lukes Road, and therefore running behind the houses there, before turning into Johnsons' site. Well, you can't win 'em all. Castlefields way: plausible, but wrong. Then I saw Tony Clayton's map. Pity about that trench in the field - I was pleased with myself for finding that - it was the first unmarked discovery I made. There is now (May 2000) housing built on this site. The aqueduct at Aqueduct and the one that wasn't. One of the things I have been told, occasionally, since I have lived here, is that the big bridge opposite the Britannia pub in Aqueduct was the aqueduct. Well - I should have known better than to believe it - I just didn't use my eyes. For a start, the path over the top of is sloping, at a gradient which is more-or-less steady for a mile either side. Also, there are only two courses of stone between the top of the arch and the footpath level - the higher parapet has been added later and is above ground level. Nowhere for the necessary four feet of water. The real aqueduct, at the end of Chapel Lane, is elegant, yes, but a stronger build altogether with a great deal of stone between the arch and the parapet. But for a long time, I couldn't see how water at that level met water at the Silkin Way level: well, it didn't! The builders of the railway excavated the canal bed to obtain a steady decline. The Aqueduct is now clearly signposted from Castlefields Way. A railway on the canal bed. A statement that I have seen in several places, including the Ironbridge Gorge Museum, caused me a lot of bother. It is said that "the railway was built on the bed of the canal". The railway referred to, is the line from Oakengates through Hollinswood, down the Silkin Way to Aqueduct and on to Madeley and Coalport. Attempts to apply that statement, and to find the canal at that level were partly responsible for my total failure last time I attempted it - with much less determination - five or six years earlier. I should have observed that the railway slopes constantly most of the way from the modern Town Centre to Madeley - south of which it slopes a great deal more steeply as it descends into the Ironbridge Gorge; so the statement cannot be literally true. 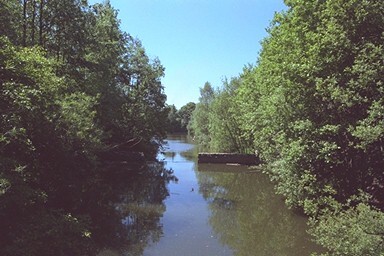 The canal must have been at the level of the Aqueduct, the stretch at Hinkshay Pools and the remaining dry bed at the Cockshutt. It would have crossed the modern line of Southall Road just to the west of the road bridge over the former railway, and continued up the line of the railway, but over your head, as you walk up the Silkin Way - otherwise the railway - in a deep cutting. A few hundred yards on, there is a bridge carrying a footpath, and (although you can't see them) a terrace of houses called Tunnel Cottages stand on Aqueduct Lane to your right. Between these two bridges was the junction with the Coalbrookdale arm, and the start of the tunnel. Although the railway (and the modern path) runs in a cutting, the canal must have been higher up in its comparatively shallow tunnel. Apart from one short detour at Hinkshay, the canal follows the line of the railway almost to Oakengates, which somewhat further on may indeed have been built on its bed. South of Aqueduct, the canal and railway took quite separate routes. It was a wet, grey Sunday in October, and I didn't intend a long walk - an hour or a bit more, maybe. But it didn't work out like that. There were a few details I needed to clarify about the canal from Aqueduct, north to Hollinswood, before writing it up. There are some clear traces, and I needed a sensible explanation of the missing bits. When I thought I'd finished, I struck off into a side-path, which intrigued me by being straight and built on a steady gradient. I followed it to where it ended in a housing estate by Malinslee Primary School, then back again to Hinkshay Pools - a couple of lakes next to each other but at very different heights. (At this point I was on my way home, and half way there.) One was a canal reservoir; the other was formed when the dam burst, many years ago! There was a board there to explain this, which also said that there was a stretch of canal nearby. This was rather distressing, as according to me the canal was a hundred yards away and rather lower down! And quite unmistakable, I thought - a clear trench running alongside the path, which is built on an old railway. Sure enough, there was about a hundred yards of canal, beyond possibility of error and complete with towpath, fishermen and ducks! I followed it one way - it converges with the old railway, alongside which there is the - I though unmistakable - bed of the canal. Confused? Join the club! Following the newly-discovered canal the other way was difficult; it runs through untended woodland, and there are brambles, nettles and fallen branches. I decided it would be easier to walk on the opposite bank of the dry canal. At this point, bemused by what I was discovering, I must have lost my presence of mind, as a famous comedian once remarked; for I stepped on to the canal bed without considering first. And went in right up to my thighs. The bottom was thick, soft mud - not wet or dirty, particularly, although a little odoriferous. But sticky. I fell on my front to avoid sinking further (which did nothing for my appearance) and scrambled out as best I could. I always was a bit concerned about the canal being so low at that point, but just put it down to my inability to gauge the rate of climb of the railway. By the end of the day, I'd been out over three hours, walked (I estimate) ten miles, right through to the other side of Hollinswood, and got home with a few points I needed to clarify before I wrote up the section. Which is where we came in. Oh well! I first tried to locate the Ketley branch of the canal by starting from the modern street called The Incline at Ketley. I explored various promising-looking trenches at the back of Red Lake church, explored both sides of the M54 and around the Ketley Lanes, went for long circular walks in Old Park and thereabouts, and got fairly well scratched looking for a possible tunnel entrance at The Rock; and all the time I was on the wrong side of the hill. I also found various bits of railway in Ketley Town (see here). But no canal. The truth is, that the Ketley inclined plane did not lie where the eponymous The Incline is, but began at its foot - just sufficiently further north to make all the difference in the world. See Oakengates to Ketley. There is a spring, rising in Spring Village (surprise!) and flowing South, which gave me considerable trouble in the early days of my exploration - I kept trying to fit bits of it into my canal route. It is the reason why the canal goes so far north and doubles back: this is an early canal, and the idea of an extended viaduct across the valley might not have been considered. Or maybe the ground was not suitable for its construction. So the canal on its way south-west detours in a big northerly loop around the north end of Johnsons Pipes, below the steep rise in ground levels at the top of which stands Horsehay. There was talk of a link to Horsehay, but a plateway was used instead. From the bottom of the Wrockwardine Wood Inclined Plane there is a modern path (off Plough Road next to the Wrockwardine Wood Way bridge) which leads between some industrial premises and houses at the back of Smith Crescent. About 150 yards along the path, it passes over what appears to be the mouth of a tunnel. I did think that the junction was north of this short tunnel, but was not sure. It puzzled me that it was not mentioned in any book or shown on any map I'd seen. Until I was shown the tunnel, I believed the canal to have run through the middle of the factories south of the path. Then, if you continue along the path, turn right at the end of the factory fence and continue, you will eventually, just before St Georges Road Roundabout at the top of Donnington, find a dip in the path. I thought that perhaps this represented where the canal left the factory premises, making its way towards St Georges Road at an oblique angle across the path; but the discovery of the tunnel meant that the canal was probably always north of this path; and this remains true. The reason I'm writing is to put you right on one small point of detail. I lived with my parents at 7 Smith Crescent for 22 years from 1963 and the lay of the land changed quite drastically along the crescent during the 1960's and 1970's. (It's probably changed further since then, but I haven't been back for around 14 years!). There is not and never was a tunnel beneath Smith Crescent. What appears to be a tunnel emerging from under the eastern end of Smith Crescent is actually a bridge. I used to play under it as a child. The area immediately to the north of Smith Crescent is land fill, as is the eastern end of the crescent. The eastern end of the crescent is a few years younger than the western end which connects to Furnace Lane. For years, the very end house on the crescent (which used to be the home of a local vicar) was in danger of subsidence because the land fill by the bridge was largely soil and chunks of old concrete. I believe that the canal used to run just north of the crescent, the tow path possibly running along the general garden boundaries on that side. Certainly there was no sign of the canal proper during the time that I lived there, but local tradition had it in that area and the land level has been raised by 15-20 feet since 1963.